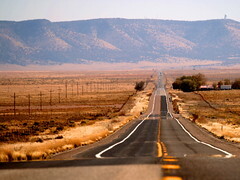 A long, straight stretch of US Route 66 between Peach Springs, Arizona, and Seligman, Arizona. This road was mostly abandoned when Interstate 40 was completed. Update 1: This photo was #31 on Flickr's Explore page on October 28, 2008. Woohoo! Update 2: This photo was used to accompany the article Traveling in Slow Motion by Sarah Menkedick on the Brave New Traveler website. Update 3: This photo was used to accompany the article Traveling in Slow Motion by Sarah Menkedick on the Global Visionent Travel Guides website.